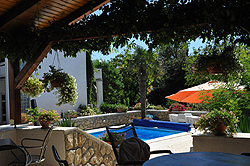 This large country house with a beautiful view is suitable for a calm and relaxed vacation. It’s on a hill, surrounded by olive trees, beautiful garden with fire-place grill and shady parking lot. The country house has 1 double bedroom, 1 very large living room with comfortable sleeping possibility, 2 bathroom, open kitchen, dining-room, SAT-TV, free WIFI, air conditioning system and large terrace. In front of the house is a large meadow (2000 m2), on which children can play carelessly. A garden seat set on the terrace is also available. This house is ideal for familys with a dog. Part of the garden is fenced, the dogs have enough possibilities for a run out. There is no traffic noise. The road that leads to the house ends in front of the house. The closest grocery shop is 800 m away and while the sand beach "Veli mel" is some 2500 m from the house. In addition to this sandy beach there is also a dog beach.The town center of Rab is about 5 km far away. 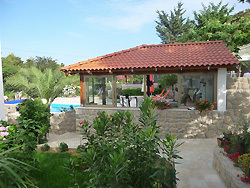 The Country house is about 800 m away from our Apartmenthous Angela with pool.